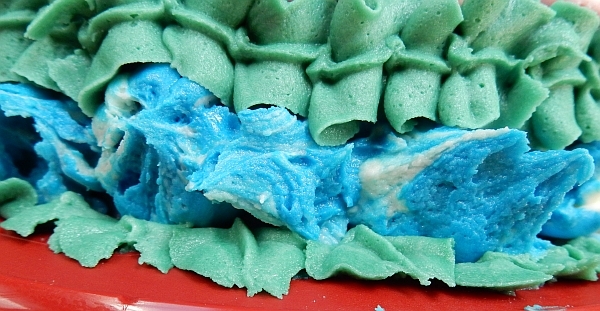 A big trend going around cake decorator circles for the last six months or so has been “Russian piping tips”, which are large, multi-holed icing tips that are supposed to instantly give you all kinds of floral effects. And I do mean large: these will not fit on a standard coupler! I decided I wanted to have a play, so I searched various websites and decided on some food-grade plastic ones I found on ebay (that’s a direct link to where I bought them, which may change in the future so search for plastic Russian piping tips, and no that is not an affiliate link or anything, I am not getting paid or compensated in any way for this review). I figured since I’m generally bad about getting around to cleaning up after rushing a cake out the door and am prone to leaving bags and tips waiting to be washed – which can leave metal tips rusty – the availability of a plastic version was a good choice to try. Being able to get 14 varieties for only £8.99 from within the UK was a great deal. This evening I’m going to my WI craft club meeting (I am so like totes British now, all y’all) so since I had spare buttercream from a major cake I’m working on for this coming weekend, I decided to whip up an extra version of my favourite chocolate cake recipe in my 10″ pan so I could have a go with the new tips. I knew my WI friends would just be happy someone brought cake to eat, which means I could freely play with the tips for the first time without having to worry about perfection for a judge or customer. My verdict is that these tips are tons of fun but do take some practice, and if like me you have hot hands that soften buttercream, you should probably pop your bag in the fridge every once in awhile. I didn’t, and you’ll see below what happened as a result. 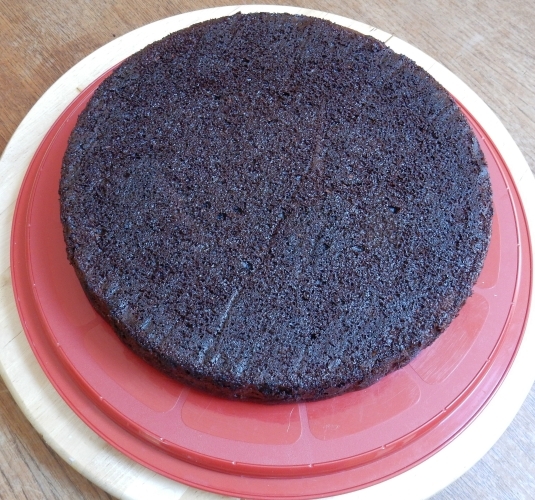 I started with the unlevelled chocolate cake exactly as it came out of the pan, put upside down so the flatter side was showing (part of why I love this recipe is the cakes come out fairly level anyway). I cooled it for a few hours, and then got to work. I baked the cake on a parchment circle for that nice flat bottom, but didn’t level the other side at all. I didn’t cut and fill it because I knew I’d be piling buttercream thick on top and really, the point here was to have a canvas for play more than a perfect cake. I mixed some of the icing with Americolor Regal Purple and spread that on as a base, and then prepped three bags of multicoloured icing. 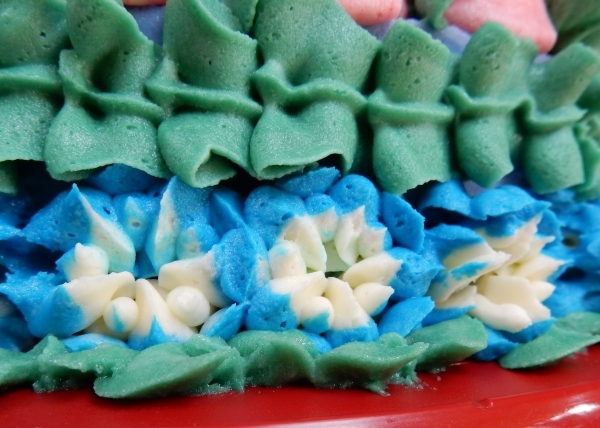 I haven’t done a lot with mixed buttercream colours in one bag before, so part of this play was messing around with the colours to see what happened. The left one below has yellow (Americolor Electric Yellow) wiped around the inner lining of the bag with pink (Americolor Electric Pink) dolloped in the middle. The middle one has pink around the bag with plain, uncoloured buttercream in the middle. The right bag has blue (Americolor Royal Blue) around the outside and also plain in the middle. The tip patterns don’t have names, but the middle one makes rosettes and the outer ones make flowers with spiky interiors. I should name them, but knowing me the names would have to be silly ones…let’s save that for another post when I’ve tried all 14. I also reserved some to mix as green at the end (Americolor Forest Green) to do as leaves using a standard Wilton #70 tip (which is also when I discovered that piping leaves with points is a lot harder than it looks, because I’m not sure any of mine came out with points…and again, I bet you none of the ladies at my craft group tonight will mind!). A fairly garish cake but a good sampling of where the tips worked and where they didn’t. Click for a larger version. Definitely not my usual style of cake (needs more blood), but it was fun to play and I bet everyone tonight will dig in. I started with the pink and white one, which makes rosettes. My first few came out mixed, but I think I didn’t put enough white in the bag because after those they were all pink. I learned fast that it’s not 100% easy to get all of the petals – especially the interior ones – to stick to the cake, so sometimes I had to go back and re-pipe to make interior petals at all. Other times I left them a bit under done in the middle. My first rosettes with good colour blending, and you can see some of the better yellow-pink ones there as well. Later rosettes came out single coloured. Next I did a circle of the yellow and pink ones, and the dotted interiors were particularly hard to make stick on the cake. You have to really push down on that first squeeze, but if the icing is getting hot in your hand it’s easy to squoosh it out too far too fast. I got nice colour variation on these at least, and was really happy when I saw some of the outer petals come out two-toned. I just wish they’d held their shape better but again, I’ve learned to chill my buttercream more next time. Two-toned outer petals are fun. Although you can really see in this picture how terrible I am at piping leaves! Evidence must be eaten soon! The blue exterior and white interior is really nice. No really, these are flowers…post-lawnmower. Yes. I did this as an afterthought in seconds. Imagine if you used these tips with actual skill and forethought! 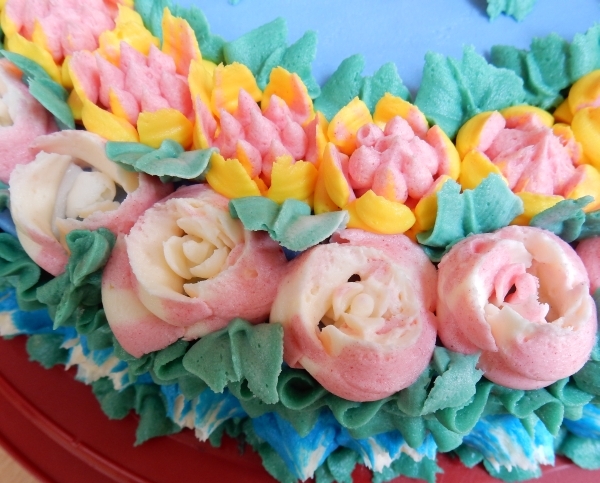 My overall review is that Russian piping tips make fancy flowers really fast. It took longer to colour the icing and fill the bags than it did to do the whole cake. 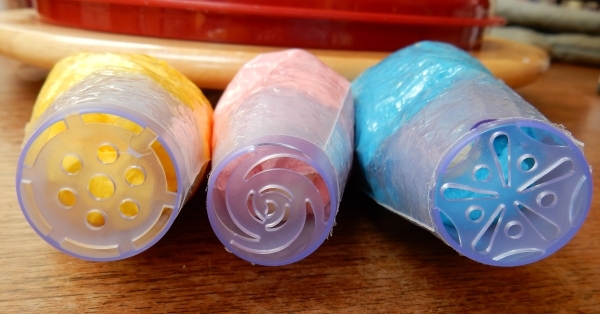 These would be a fun way to use up all kinds of extra colours of buttercream after other cake projects, especially on cupcakes. Blort blort blort and you’re done. And that’s just three of the tips…I haven’t even tried the other 11 yet! 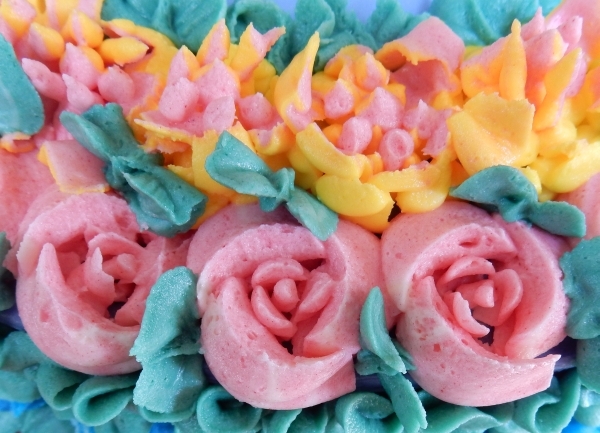 I’d say if you are keen to play around with buttercream flowers in a fun, casual way, get yourself some of these tips, especially if you can find a good deal. 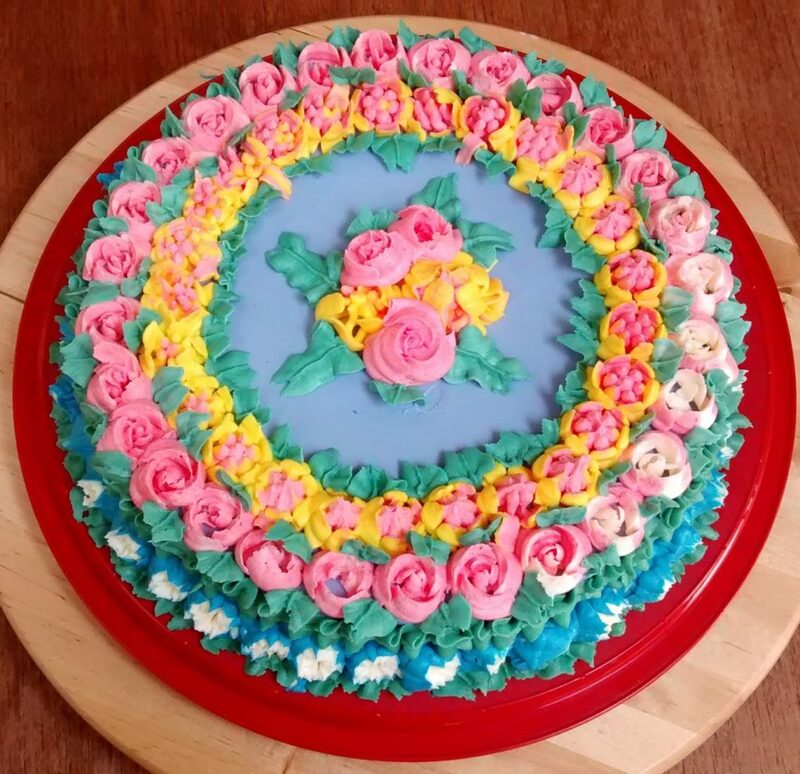 Be aware that they take some practice and don’t expect perfection right away, but in terms of plopping together a super-fast floral cake for friends or a tea party, they’re just about perfect. This entry was posted in Buttercream Techniques, Cake Decorating, Fancy cakes, Products. Bookmark the permalink. My husband is going to be mad at me. I have to buy these tips. I must have them. 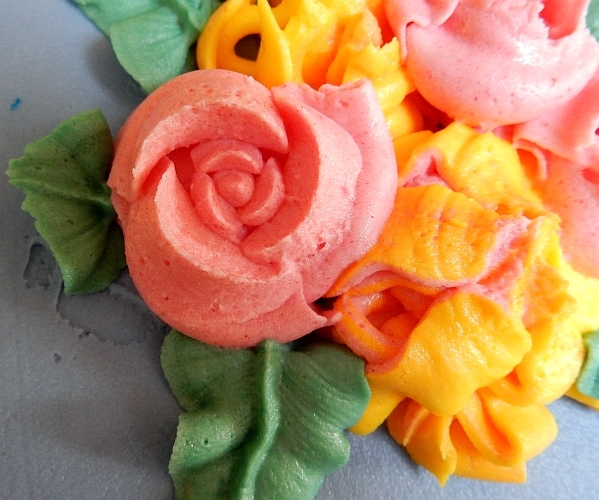 My mom taught me how to make roses, but it’s a much more complicated process than with these Russian piping tips. Thanks for the great review and the tips about using the tips. And now I’ve gone and bought some. The idea that I might be able to make a flower with just one tip is too much to resist. Thank you for sharing! I love the honesty! Gave me a good chuckle. I'm going to have to go give mine a try one of these days. Thank you for the tips! The Idea of instant super fancy cupcakes makes my mind spin. I have been casually decorating cakes since I was about 12 years old and 38+ years later I still couldnt make a rose if my life depended on it. The idea that you just squooshed those out in seconds AND decorated a whole cake with them makes me believe that you are truly the CAKE GODDESS!!! Of course now I need a set of those tips and I need to make cupcakes…super fancy ones.